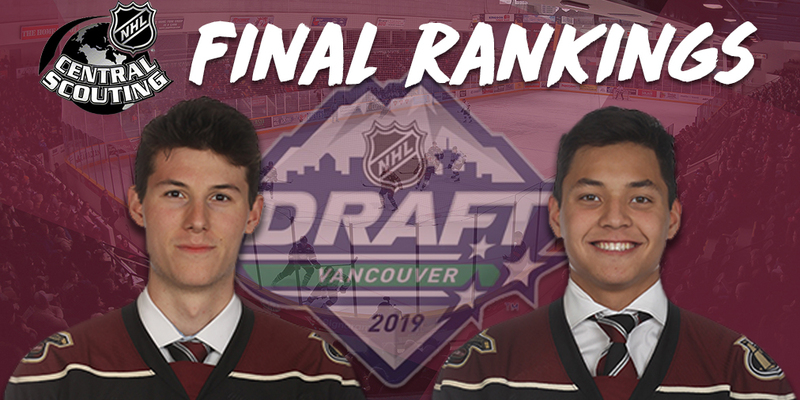 The NHL Central Scouting Service has released its final rankings ahead of the 2019 NHL Entry Draft in Vancouver. Two Petes players, including Hunter Jones and Nick Robertson, were named to the list. Jones, who is the 3rd ranked North American goalie heading into the draft, played to a 28-24-2-2 record this season with a 3.31 goals against average and 0.902 save percentage. The 6’4”, 197lbs Brantford, Ontario native is the Petes’ nomination for the Red Tilson Trophy as the team’s Most Outstanding Player of the Year. Robertson is the 17th ranked North American skater, moving up 13 spots from 30th on Central Scouting’s midterm rankings in January. The 5’9”, 160lbs left winger from Northville, Michigan amassed 27 goals and 28 assists for 55 points in 54 games (1.02 points per game) this season. The 2019 NHL Entry Draft takes place in Vancouver, British Columbia on June 21-22 at Rogers Arena. Peterborough’s 2018-19 roster features eight players selected in previous NHL Entry Drafts, including Austin Osmanski (Buffalo), Chris Paquette (Tampa Bay), Cole Fraser (Detroit), Zach Gallant (Detroit), Declan Chisholm (Winnipeg), Semyon Der-Arguchintsev (Toronto), Liam Kirk (Arizona), and Ryan Merkley (San Jose). Become a member of the Petes family with a Season Ticket Membership! The season ticket early-bird deadline is May 31, 2019. Call Mike at (705) 743-3681 ext. 263. Select sponsorship inventory is also available if you’re interested in growing your brand. To learn more, contact Greg at (705) 743-3681 ext. 227.